Heeft u een vraag voor Travel Lodge Maldives? Ontworpen voor zowel zakelijke reizigers als toeristen, is het Travel Lodge Maldives ideaal gelegen in Male Internationale Luchthaven; één van de meest populaire buurten van de stad. Op slechts 2.5 km afstand, kan dit 3-sterren hotel eenvoudig worden bereikt vanaf het vliegveld. Dankzij de praktische locatie liggen alle belangrijke trekpleisters in de buurt van het hotel. Profiteer van de ongeëvenaarde dienstverlening en voorzieningen in dit hotel in Male Stad en Luchthaven. Gasten kunnen gebruikmaken van hotelfaciliteiten als 24-uur roomservice, gratis wi-fi in alle kamers, 24-uur beveiliging, dagelijkse schoonmaak, boodschap bezorging. Het hotel heeft 9 prachtig ingerichte kamers voor gasten, elk met internet (draadloos), draadloos internet (gratis), rookvrije kamers, airconditioning, bureau. Het hotel biedt vele unieke recreatiemogelijkheden zoals boten, kano, watersportmateriaal verhuur, windsurfen, snorkelen. Het Travel Lodge Maldives is een ideale verblijfsplaats voor reizigers die charme, comfort en gemak zoeken in Male Stad en Luchthaven. we stayed here to wait private jet to the island for next day. good location and price for short stay. it is far away from the airport, we had to spend for a long time to wait for the van about 2 hours. Fair place, suitable for a short stay. 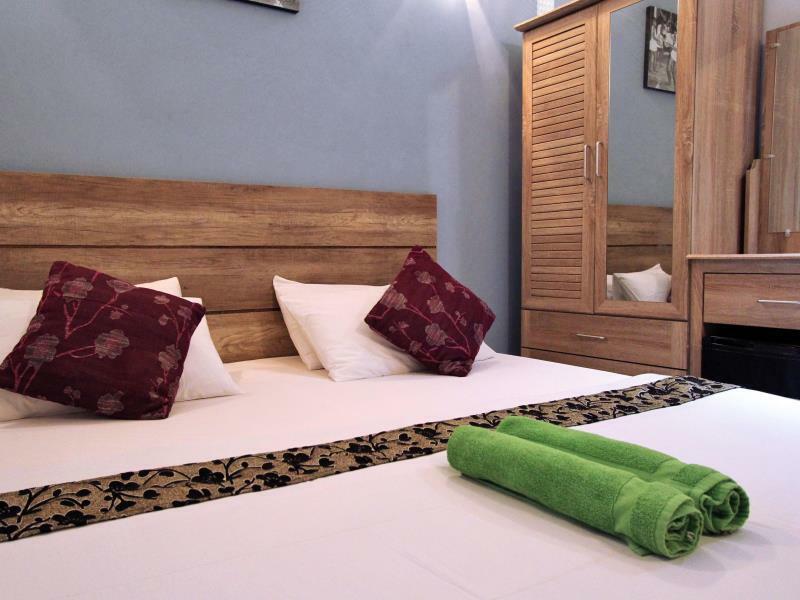 The hotel is situated in Hulhumale, near the airport and the beautiful Hulhumale beach. Resraunts and conveniances shops are easily found nearby. The staff will help you to book excursions if needed. Great location and helpful staff. Constructions are going on nearby, which may disturb, if you want to sleep during daytime. Our room was clean but I cannot tell any difference between super deluxe versus standard/deluxe rooms. We booked a super deluxe room, but there was no TV, no minibar, no balcony or partial sea view. Those could be found in the common areas though. For example the roof terrace is nice. The wifi works barely, but I think it's a common problem in Maldives. Its was nice stay in the travel lodge .. Price was reasonable, the staff very respectful and nice .. I spend like 4 days and its like i live with a great family.. The location amazing just few steps from the white sand beach of hulhumalé.. I recommend it for budget traveler..
Staff are friendly and helpful bt not able to provide information on tours as they were unable to contact the tor provider for threee days. It is not a 3 star hotel not even 2 if you consider the facilities it has. No coffee shop and restaurant It is I have been travelling for 30 years How Agoda consider this a 3 star. It is just a 3 floor apartment. Agoda have to reevaluate how they classify hotel. They charge 3 times the rate for hotel transfer. I only spent one night at this lodge b/c I was headed to a resort the following day - but the staff was really great and helpful my room was very, very clean. Would recommend. Excellent staff service! 10mins from hotel! Clean rooms for transit! This hotel is meant for a night stay when you arrive Male airport after cutt off for transfers. near to airport and male city, 10 mins drive at 10 usd and fairy from hulhumale to male city will take at least 20 mins. 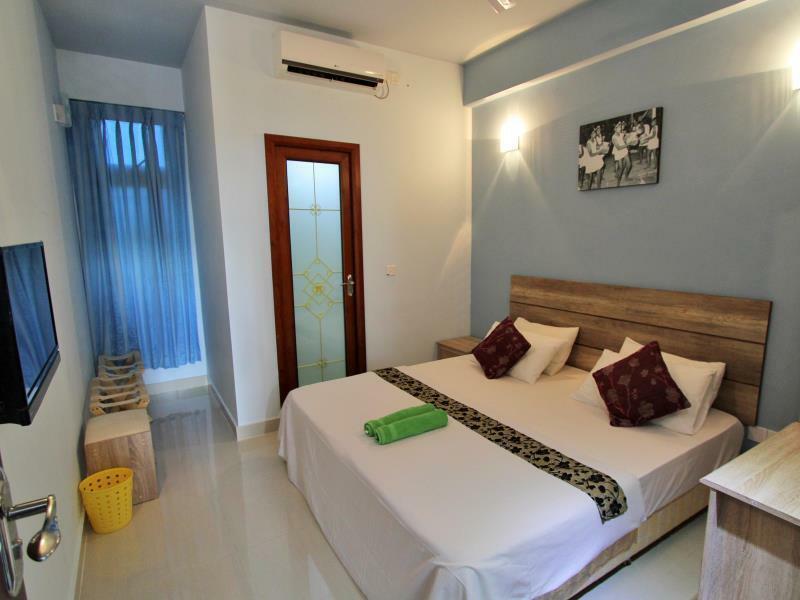 Good choice for stay a night at Male, convincing price and people from the hotel are nice, rooms are comfortable in general. Hotel will arrange transportation, from the airport on first day and to the islands next day. Considerate service with cheap price, fast check in and check out. Overall not too bad. Value for money but only for stop over. We arrived in Male at around 11 p.m. and we were told our sea plane would be 6 a.m.! So we really didn't stay in this hotel for long. Not even have time to have the breakfast. But fair to say they have nice staff. Worth a try next time. Staff were ok, location about 15min taxi from the airport. The photos do not show the true state of the rooms. We booked "super delux" and there were dirty sheets, exposed wiring and holes in the walls. If you are after a budget backpackers accommodation this place is fine. If you are after anything above this standard stay elsewhere. Please also note this place has nothing to do with the chain. Not good at all. The hotel was overbooked, even though we have paid and confirm the room in advance. They sent us to another hotel down the street. If you just plan to stay overnight, thats ok. But never spend your vacation at this hotel.